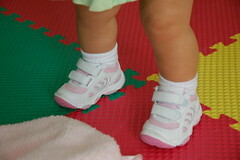 Since she's really walking now, we went and got her real walking shoes last night. She's a girl after Grandmomma's own heart - she seemed to really like the shoe store! Next time you're in town Mom, I know where Anne Marie is going to want to go. We tried on a bunch but these worked the best for the remainder of the summer/early fall. She'll need new ones in about three months anyways. She's really really cute in these and she's ready to keep up with (and probably run ahead of) Mom now.